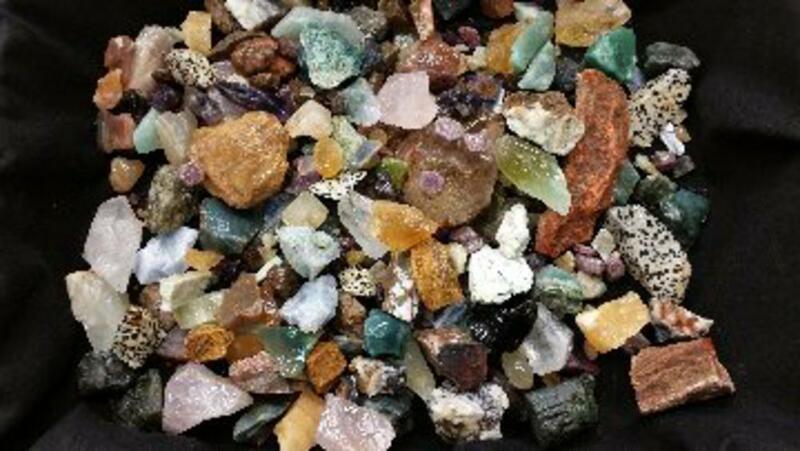 A huge bag (6-7 pounds) with a large cross section of our most popular gems. A nice mix of Amethyst, Citrine, Aventurine, Topaz, Moonstone, Ruby, Sapphire, Emerald, Quartz, Aquamarine, Tourmaline, Peridot, Agates, Jaspers, Calcites, Flourite and others. This sampler contains twice the amount and larger pieces than the small gem sampler. You may find things not in the small sampler as well. This is our best value! Stones vary from specimen, tumbling, cabbing even some facet quality. Holy Cow! What a mother load! Good grief there's a lot of stuff in this sampler. I picked the best out to facet, some emeralds rubies and sapphires to cab and been tumbling the rest. Great variety, great value, quick shipping. Will order again thanks!